Included in this purchase is a 40 slide PowerPoint presentation for "calling" bingo with a different transformation problem on each slide. 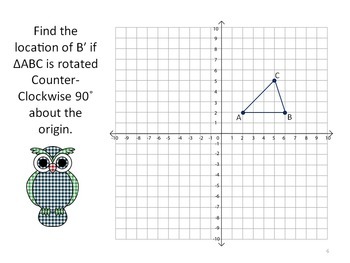 There are 16 problems where the student must find the new coordinate after a rotation (clockwise and counter-clockwise), 10 problems where the student must find the new coordinate after a reflection, and 10 problems where the student must find the new coordinate after a translation. This is great for practicing 8.G.A.3: Describe the effect of dilations, translations, rotations, and reflections on two-dimensional figures using coordinates. Please note: this game does not include dilations. See picture previews for example. I have included a pdf document that will print with 6 coordinate planes per page that the students can use as their scratch work. 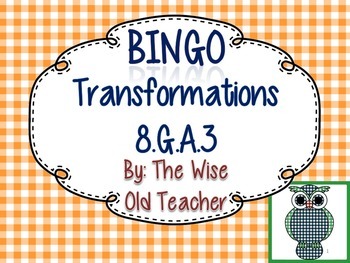 Another option is to copy and paste the coordinates from the slide into one of the many free Bingo Card Generators online and print the cards for your class. Once the Bingo cards are filled in/created, you are ready to play. Just click through the PowerPoint in order or rearrange the slides randomly making sure to keep track of the amounts you have shown so you can check the winner! An answer key is provided for easy checking. I started using this method of playing Bingo years ago with my classes. The kids LOVE to fill in their own cards. Can be played over and over again! Of course, this can just be used as a review without playing it as a Bingo game.